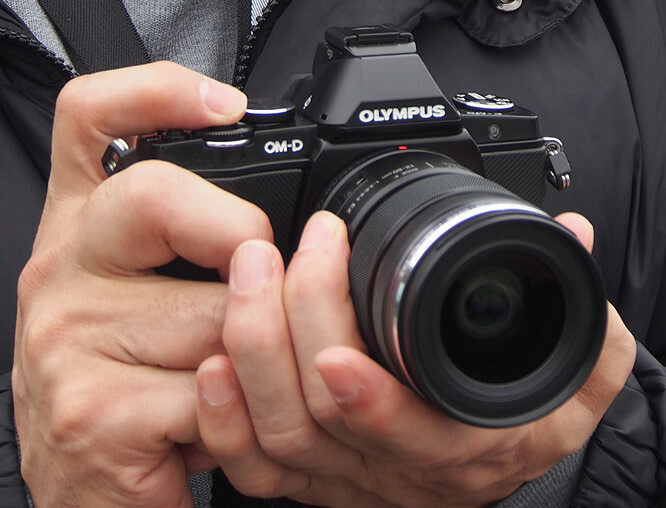 We give our first impressions on the new Olympus OM-D E-M5 with updated sample photos and more. The E-M5 is the latest Micro Four Thirds camera and has an impressive specification. Previously we posted our hands-on preview, and sample photos from the Olympus OM-D E-M5, and we've been able to spend some time taking photos with the camera and testing it to its limits under a variety of conditions. Here we post our hands-on first impressions review of the Olympus OM-D E-M5. We tested a nearly final pre-production version of the camera, running a beta version of the firmware and although the image quality is said not to be final, the camera operated and performed extremely well without any cause for concern. 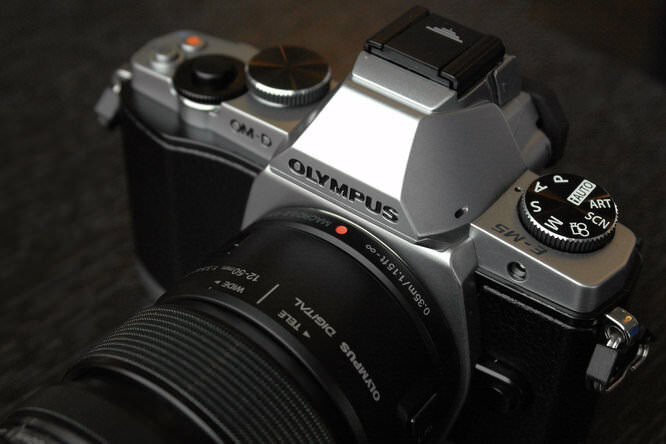 Read our full Olympus OM-D E-M5 Review here. 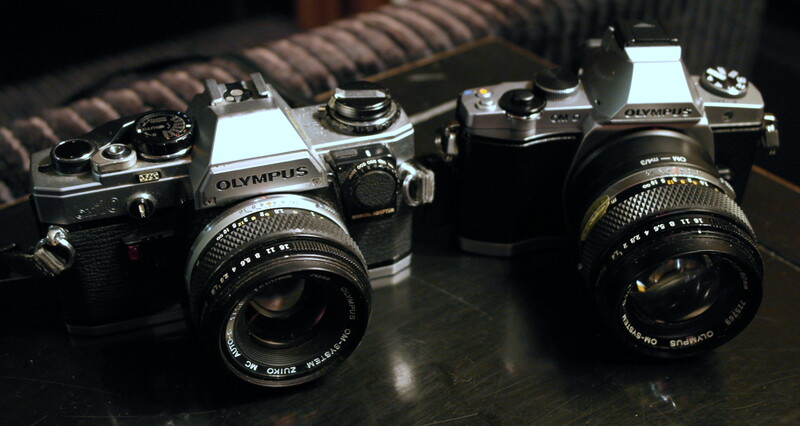 Olympus OM and Olympus OM-D with OM to M43 adapter. The Olympus OM-D E-M5 is the beginning of a new line of cameras from Olympus, with it being the Digital version of the OM series, however, as you can see in the photo above, when compared to one of the original Olympus OM film cameras, the OM-10, the digital version is much smaller, even when using an OM lens and adapter. When we asked for the reason behind the new name, we were simply told it's a mystery, although Olympus did say they are often keen to avoid any confusion by having a name similar to other camera manufacturers, unlike some! This is the first Micro Four Thirds camera from Olympus with a built in viewfinder, previously if you wanted a viewfinder, you would either need to buy an optional electronic viewfinder from Olympus, or look at the Panasonic Lumix G series of cameras. The viewfinder features 1.44 million pixels, eye-detection, and dioptre correction. Video features are updated to include additional features previously unseen on Olympus Micro Four Thirds cameras such as microphone level adjustment (three levels) and wind noise reduction. Handling - The mode dial is on the left and the camera has front and rear dials on the top, plus top function and video buttons. It feels more compact than the Olympus PEN E-P3, but is larger than the E-PL3. There is a large rear thumb grip and a textured leather effect front grip that covers the camera across the front, as well as side access to the SD memory card - this is weather sealed. The buttons are quite chunky making it possible to use the camera in cold weather when wearing gloves even though the buttons are quite small the amount they protrude from the camera helps. 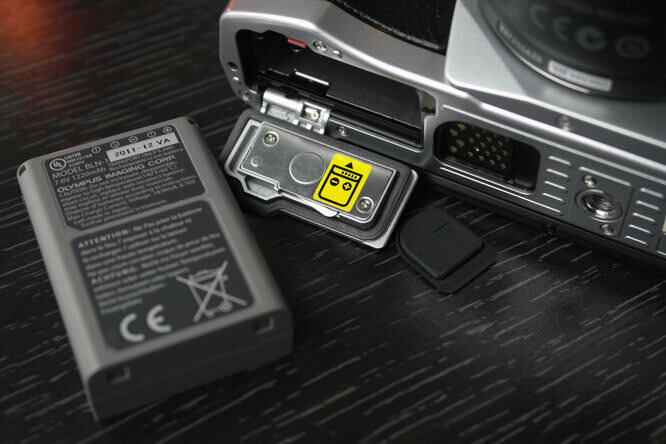 Battery Life - The camera's battery life is rated at 330 shots (the same as the Olympus PEN E-P3) which is similar to other mirrorless cameras, for example the Panasonic Lumix GX1 has battery life rated at 310 shots, while the Sony NEX-5N has battery life rated at 400 shots. Battery life can be extended to 650 shots with the optional battery grip. We took nearly 1000 photos before the battery went flat, although a number of these were taken using the 9fps shooting mode, as well as using the Art Filter bracketing mode that automatically duplicates the same photo with each Art Filter selected applied. Speed - We were not able to test the cameras speed scientifically, however Olympus has said that the focusing and shutter response is quicker than the Olympus PEN E-P3, which was very quick, so we expect to see good results when we do test the cameras speed in the studio. In our time shooting with the camera, focusing was very quick, the continuous shooting was as quick as expected shooting at 9fps and the camera responded quickly each time we came to use it. The EVF refresh speed can also be increased and the effects of IS can be viewed in the EVF. Here are several sample photos from a pre-production version of the new Olympus OM-D E-M5, it is running a firmware that is not yet finalised so we have been asked to resize the images to 1600 pixels wide. 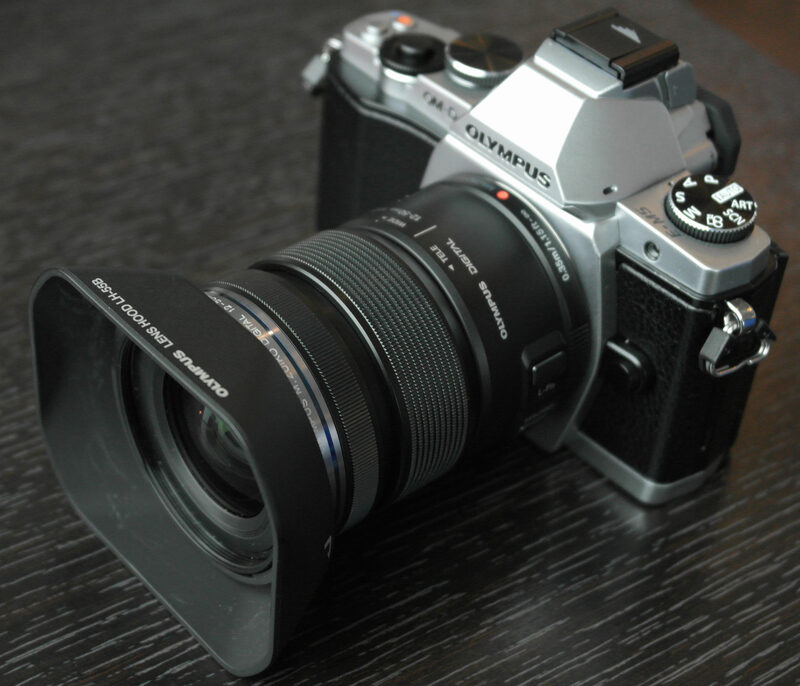 The camera was tested with the 12-50mm lens as shown above, as well as a few other lenses, including the excellent Olympus M. Zuiko 45mm f/1.8 lens. If you have any questions or want to discuss the camera, please post in the forum. Additional photos of the camera and sample photos can be found in the Equipment Database. The camera has an updated range of Art Filters, including a new Key Line mode that was described as similar to "Manga" and being all about emphasis of the lines in the image. Dramatic Tone has been updated to include a new black and white version and there are further options for Cross Process. Image stabilisation appears to have worked extremely well with the photo taken in the hotel at 1/6th of a second producing a sharp image. Olympus say that the camera has 1 stop lower noise compared to the 12 megapixel sensor in the Olympus PEN E-P3, as well as 1/3 stop better Dynamic Range. Another unique feature of the E-M5 is a new "Live Bulb" mode, you set the camera up in the normal way with a remote release, press the shutter button and hold it and while you're taking the photo, the exposure is shown on the rear screen of the camera "developing" as you watch it, so you can decide when the photo is exposed correctly. We tried this and were impressed by the results, an example can be seen above in the test shots. The OM-D is available from April 2012 as a kit with the M.ZUIKO DIGITAL ED 12-50mm 1:3.5-6.3 for £1149.99. This puts it into the premium mirrorless camera market, although this is the only model to feature a weather resistant body making it somewhat unique. 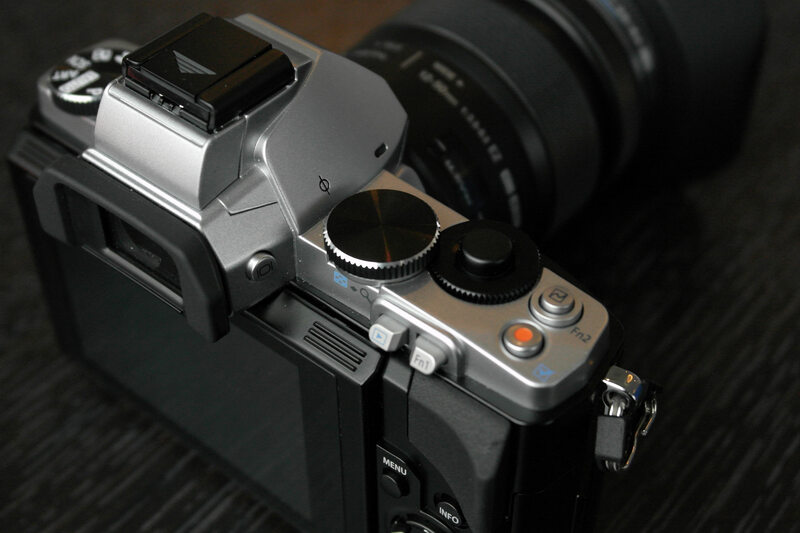 Alternatives include the 24.3 megapixel Sony NEX-7 and 16 megapixel Fujifilm FinePix X-Pro1. The Olympus OM-D E-M5 will benefit from a high speed memory card and a case or bag to keep your camera safe and protected - have a look at our complete guide to camera bags. Rather than come to the table with a retro / classic styled camera, the OM-D E-M5 takes the premium mirrorless market one step further, with a weather sealed body, making it more useful for outdoors photographers and those looking for a professional level camera that's (much) smaller than the typical weather sealed Digital SLR. With the new camera, Olympus has also introduced two new lenses, a 75mm portrait lens and a weather sealed 60mm macro lens, further expanding the appeal of the system. This brings the total number of lenses available for the Micro Four Thirds mount to nearly 30 lenses and this is just from Olympus and Panasonic with a number of other lenses from other third party manufacturers also available. When the Olympus OM-D E-M5 details were announced bit by bit it almost seemed too good to be true, with high speed continuous shooting, high resolution sensor, updated image stabilisation and weather sealed metal body and we were very excited to test the camera. Thankfully the camera lived up to our high expectations, and in some ways surpassed them with better than expected noise performance even at high ISO settings! The sensor in the camera has more resolution, with 16 megapixel compared to the PEN cameras 12 megapixels, yet also offers lower noise results! While the firmware may not be final, if the final results are anything like those we've seen so far, then this should be capable of producing excellent results. We look forward to testing the final version of the camera! 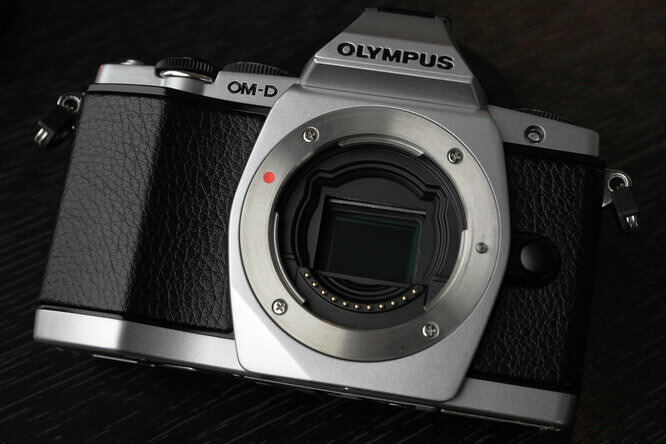 Read our full Olympus OM-D E-M5 Review here. Excellent Preview, it looks a winner, however, I hope they bring out a slightly cheaper version, may be without the weather sealing to make it more affordable to a wider market. Perhaps this could be checked out with Olympus. It will be interesting to see how picture quality compares to other M4T cameras, in particular the Panasonic 16mp G3. I have used Olympus SLR's since the early 70's. Latterly OM2n's and an OM4 which I still occasionally use as I do the Zuico lenses on my E-3 DSLR. I naturally progressed to the Olympus DSLR's starting with the E-500 and latterly an E-3 - both are capable of excellent results in the right conditions but the 4/3 system has proved to be far less than satisfactory in night and low light situations and totally unsuitable at ISO's above 400 really because of excessive noise. I have been forced to de-camp to the ubiquitous Nikon camp where I can use ISO 800 and even 1200 with better low light results than Olympus at 200! I do not consider the 4/3 system to be on a par with the larger sensors from other marques and from what I've seen of the micro 4/3 it's even worse. So the OM-D looks superb and it would fit fine in my retro bag with the OM-2n but there's only so many times you can present the results in monochrome and claim the noise is 'intentional' grain. Olympus and I - end of a 40 year relationship - sorry. I had OM1, and OM2n's and there's a definite retro lure for me here from those happy days of film! Would agree with brubaker on noise at higher ISOs from my 1st gen GF-1, it's definitely high above 400. From samples I've seen though, the newer gen 16MP 4/3 sensor seems to have much lower noise. The 1600 ISO samples I've seen have less noise than my older 14MP sensor at 400 ISO. My aging Canon 40D will pack up at some stage, or I'll finally want to change it. At that point I'll definitely look if 4/3 can give me both SLR and compact body with 1 series of lenses. So far, I reckon it's looking hopeful. My gripe isn't noise but the lack of shallow DoF - that's the one area I don't think you can ever solve in 4/3 unless you are happy to achieve it through post processing effects. I had OM1, and OM2n's and there's a definite retro lure for me here from those happy days of film! Would agree with brubaker on noise at higher ISOs from my 1st gen GF-1, it's definitely high above 400. From samples I've seen though, the newer gen 16MP 4/3 sensor seems to have much lower noise. The 1600 ISO samples I've seen have less noise than my older 14MP sensor at 400 ISO. My aging Canon 40D will pack up at some stage, or I'll finally want to change it. At that point I'll definitely look if 4/3 can give me both SLR and compact body with 1 series of lenses. So far, I reckon it's looking hopeful. My gripe isn't noise but the lack of shallow DoF - that's the one area I don't think you can ever solve in 4/3 unless you are happy to achieve it through post processing effects. [quote]My gripe isn't noise but the lack of shallow DoF[/quote] No problems there, have you ever used 4/3 or M4/3 ? No problems there, have you ever used 4/3 or M4/3 ? [quote]My gripe isn't noise but the lack of shallow DoF No problems there, have you ever used 4/3 or M4/3 ? [/quote] Yep - as per my note, I use a Gf-1 regularly with the 20mm 1.7 pancake. It's nice, but the DoF is noticeably broader than my current 50mm 1.4 on APS-C, not to mention on a FF which I've borrowed occasionally. Yep - as per my note, I use a Gf-1 regularly with the 20mm 1.7 pancake. It's nice, but the DoF is noticeably broader than my current 50mm 1.4 on APS-C, not to mention on a FF which I've borrowed occasionally. [quote]@walkerr Apples to Oranges...try compare Olympus 45mm f1.8 with your 50mm f1.4. 20mm its too wide (and slower) to give you very shallow DOF...;)[/quote] Maybe I'm missing something here: 20mm on 4/3 = 40mm on FF. So 50mm is not far out, 20mm on 4/3 is def not wide angle and one is 1.7 and the other is 1.4 45mm 1.8 on 4/3 would be a 90mm on FF ?? I shoot mostly video nowadays and use a 5D Mark II and a GH2. The GH2 is great for low light precisely because it has a smaller sensor so manageable depth of even at f/1.2. I'd LOVE to switch it for the OM-D with built in 5-axis stabiliser (which looks seriously impressive) but [b]WHY OH WHY[/b] is 24p/25p video not included!? This has become such a standard feature from every other manufacturer- Canon, Nikon, Panasonic, Sony- but not Olympus it would seem. I really want to be able to use this camera for video; it would be an amazing, small, run-and-gun solution giving stabilisation to even my old, manual focus primes but I just can't use it if it can't shoot 24p/25p. I really hope Olympus add this in firmware like Canon did with the 5D Mark II. I shoot mostly video nowadays and use a 5D Mark II and a GH2. The GH2 is great for low light precisely because it has a smaller sensor so manageable depth of even at f/1.2. I'd LOVE to switch it for the OM-D with built in 5-axis stabiliser (which looks seriously impressive) but WHY OH WHY is 24p/25p video not included!? This has become such a standard feature from every other manufacturer- Canon, Nikon, Panasonic, Sony- but not Olympus it would seem. I really want to be able to use this camera for video; it would be an amazing, small, run-and-gun solution giving stabilisation to even my old, manual focus primes but I just can't use it if it can't shoot 24p/25p. I really hope Olympus add this in firmware like Canon did with the 5D Mark II. a 20mm lens is a wide angle lens, regardless of the size of the sensor. it is still a 20mm lens. therefore it inherently has very deep depth of field. it "becomes" a 40mm lens on a m4/3 camera in "field of view" only . Quote:A 20mm lens is a wide angle lens, regardless of the size of the sensor. it is still a 20mm lens. therefore it inherently has very deep depth of field. it "becomes" a 40mm lens on a m4/3 camera in "field of view" only . Lol so it is, but in reality your talking a load of tosh, WYSIWYG. This is a major + for M4/3, the format is almost the same size as 35mm motion film camera and the lenses depth of field is more or less identical as well, video on camera`s like the 5D MK11 is something like 58% larger in scale. @ walkerr, my post was intended to be a general helpful tip for anyone who could use the info. not everyone understands the concept of depth of field and angle of view etc etc. it can be confusing for some, just trying to help. my post was intended to be a general helpful tip for anyone who could use the info. not everyone understands the concept of depth of field and angle of view etc etc. it can be confusing for some, just trying to help. Thank you... nice review and variety of samples! This is a really impressive little camera! I'd assume the "live bulb mode" shot of the fire is tripod mounted, correct? I don't understand why people are complaining that MFT cameras have more noise and more DOF than FF cameras. Duh. Buy the kind of system that best suits your needs. Or reflect on what your "needs" really are. I saw a rumour on an other site that said Olympus may not using a Panasonic sensor on the OM-D and could be using a Sony sensor! thats even better news, pete , sony does a better senor by far. Good preview; nice looking kit. It still comes accross as specialty kit though, with a lack of affordable long telephoto lenses available, which is the main reason I moved on from m4/3, plus, I am not a fan of touch screens for some reason that I can't put a finger on. The argument over what is better, inbody IS or in lens IS could soon be over. From what I understand the effect of the inbody IS can now be seen in the viewfinder. The argument over what is better, inbody IS or in lens IS could soon be over. From what I understand the effect of the inbody IS can now be seen in the viewfinder. Quote:I don't understand why people are complaining that MFT cameras have more noise and more DOF than FF cameras. Duh. Buy the kind of system that best suits your needs. Exactly! I used to use Hasselblad 6x6 and a Mamiya RB67 6x7 because the depth of field was too wide for many portraits on my Nikons. Every now and again I'd hire a 5x4 for a portrait session, again because you could get that beautifully shallow DoF you see in the old black and white Hollywood portraits, usually shot on 10x8 for ease of retouching. wow looks like they went through the dressing up box of olympus really retro? I think they have a nerve to sell a high end camera at a high price on the back of its retro looks, a grand, just for the body. The price really does need to drop before I consider buying. If Panasonic can produce a camera such as the DMC G-3 with performance to match a DSLR or at least picture quality, for £500, then why can't Olympus. 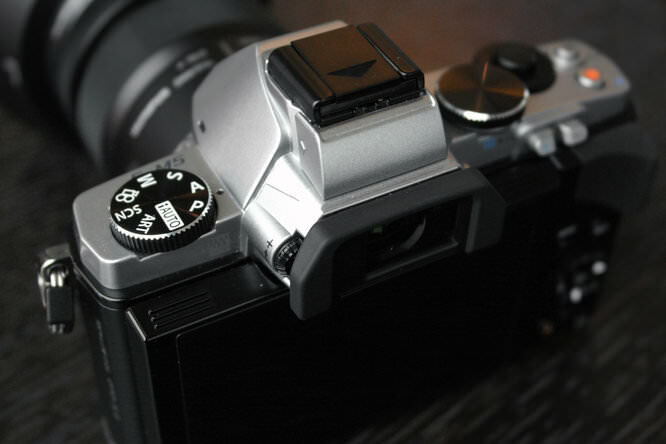 Yes I know the E-M5 is a much higher spec, but I suspect a good percentage of the price is the retro look. Just think, Panasonic had no legacy products to fall back on which could be used as a price hike. 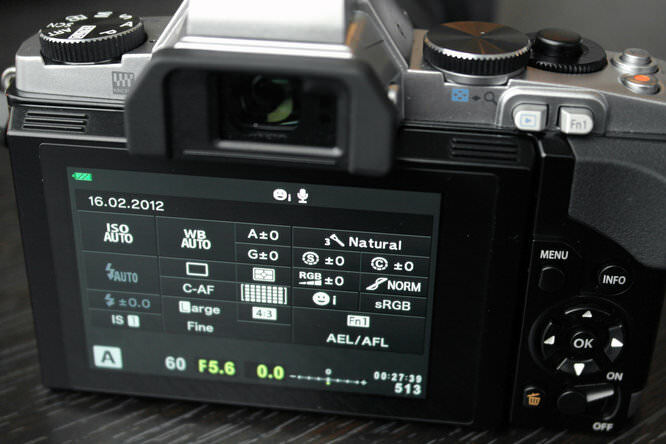 Having said all that, I still admire the quality and ethos behind the E-M5, but a bit cheaper please. Not all of us are wealthy enough to afford such luxuries so I guess I'll have to look elsewhere for an affordable camera, hello to the Panasonic GX-1, or a 'pre-owned' unit. so i want your advice & i will appreciate your quick response with full details... please . On another review site, the Oly EM-5 struggled in some areas to equal the picture quality of the Panasonic GH2. Now considering I can get a GH2 body for just over £500 and the E-M5 body is a touch over a grand [although like all new cameras, prices drop eventually], I know what I will buy if I need another M4T body.